I am wondering about a specific carbon footprint comparison (i.e. total global warming potential per litre) between soy milk and cow's milk. This would of course depend on where and how they are produced, but I'd like to know if people have sources that could potentially be gathered (or an article that already did a meta-analysis of some sort!) to have a general idea of the order of magnitude of the difference. Related question: Which is more sustainable: almond, soy, coconut, cashew or other milk? The highest values for soya milk are for the sweetened versions; the unsweetened products are at the lower end of the range. For milk, skimmed milk had the lowest and whole milk the highest CO2e. 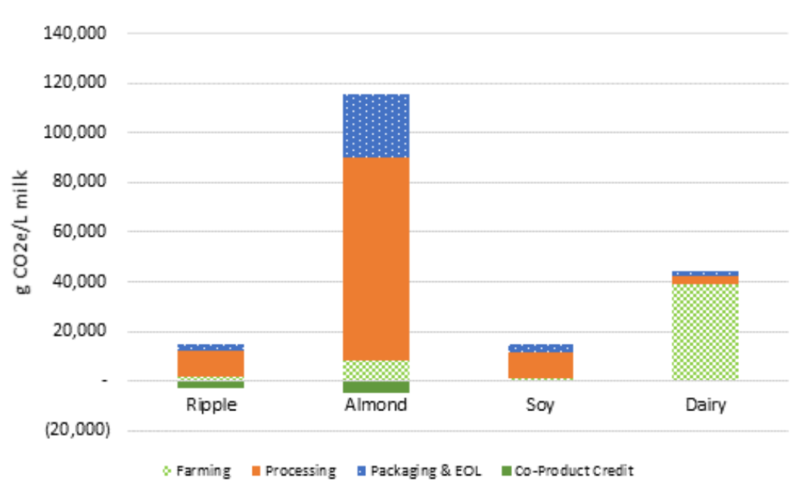 Ripple Foods, the California-based producers of non-dairy milks made from pea protein, commissioned a Life Cycle Analysis of different milk products that included both soy milk and cow/dairy milk. They concluded that soy milk has a smaller carbon footprint than dairy milk. Not the answer you're looking for? Browse other questions tagged food carbon-footprint agriculture or ask your own question. Which is more sustainable: Almond, Soy, Coconut, Cashew or Other Milk?